Fort Lauderdale, FL -- Wow! This will be the 10th year of the i-to-i! Time flies. It doesn't seem that long ago we ran the first one. Check out the website to learn the history of the event. I remember barely finishing the 2008 race but having a great time. I'll see if I can get over there that weekend. The forecast is looking great for the race. EAST NORTHEAST WINDS 14 TO 19 KNOTS ALONG THE COAST TO EAST NORTHEAST 18 TO 23 KNOTS IN THE GULF STREAM. SEAS 4 TO 6 FEET WITH OCCASIONAL SEAS UP TO 8 FEET. INTRACOASTAL WATERS ROUGH IN EXPOSED AREAS. SLIGHT CHANCE OF SHOWERS. I've heard from a few people planning to race that can make it on Sunday but not on Saturday. If the wind forecast holds and is true, it doesn't appear to matter a whole lot which day we'd run the race, so I'd like to hear from other people if they have a preference. It would be more fun to race on Sunday if the weather cooperates, but the wind comes first. In addition to perhaps better attendance on Sunday, the Hobie Cat fleet 44 is running what is the fleet believes to be the 40th anniversary of the Commodore's Cup race. I think it would be cool to be out when they are. Let me know if you have a preference to racing Saturday or Sunday. If we race Sunday is there interest in a tuning day or a pre-race clinic with racing tips, ocean sailing technique, etc. on Saturday afternoon? I can race either day! Let me know whether the consensus is for Sunday or Saturday. For now I'm assuming it's going to be on Sunday, so I probably won't arrive until late Saturday. The i-to-i Race is on for Sunday 12/2/12. Thanks again to our sponsors who have come through with piles of prizes and events for the race. The first possible start IF you do not get another email is 11 a.m. Sunday, 12/2/12, skippers meeting at 9:30 a.m. Be prompt, seriously. I don't want to have to rush the skippers meeting or cut into rigging time. First race is targeted at 11 a.m., really. We want to launch minutes after the start of the 40th Commodore's Cup. However, this is not carved in stone and could be changed, (earlier), if it becomes apparent that a mid-day wind sag is not beneficial to getting the race off. If we are targeting an earlier start at 9:00 a.m. with a 7:30 a.m. skipper's meeting, or possibly before on Sunday due to predicted conditions, another email will be sent and the http://i-to-i.org website will be updated. Don't forget your waterproof phone case & start watch! Here's why Sunday is picked. 2). We can race along with the Cat 44 Hobie Fleet running on Sunday, 11 a.m. start. EAST NORTHEAST WINDS 14 TO 19 KNOTS. SEAS 3 TO 5 FEET WITH OCCASIONAL SEAS UP TO 6 FEET. DOMINANT PERIOD 5 SECONDS. INTRACOASTAL WATERS CHOPPY IN EXPOSED AREAS. SLIGHT CHANCE OF SHOWERS. EAST NORTHEAST WINDS 17 TO 22 KNOTS. SEAS 4 TO 6 FEET WITH OCCASIONAL SEAS UP TO 8 FEET. INTRACOASTAL WATERS CHOPPY IN EXPOSED AREAS. SLIGHT CHANCE OF SHOWERS. 4). I am willing to offer a pre-race clinic 1:00 - 2:30 p.m. on Saturday, 12/1/12. I need to hear from anybody interested so I know to show up. Topics are up to the audience, but can include: shorebreak launch/landing techniques; ocean sailing tips, techniques, tuning, setup; on the water session; etc. When/if you respond let me know what would benefit you. 5). 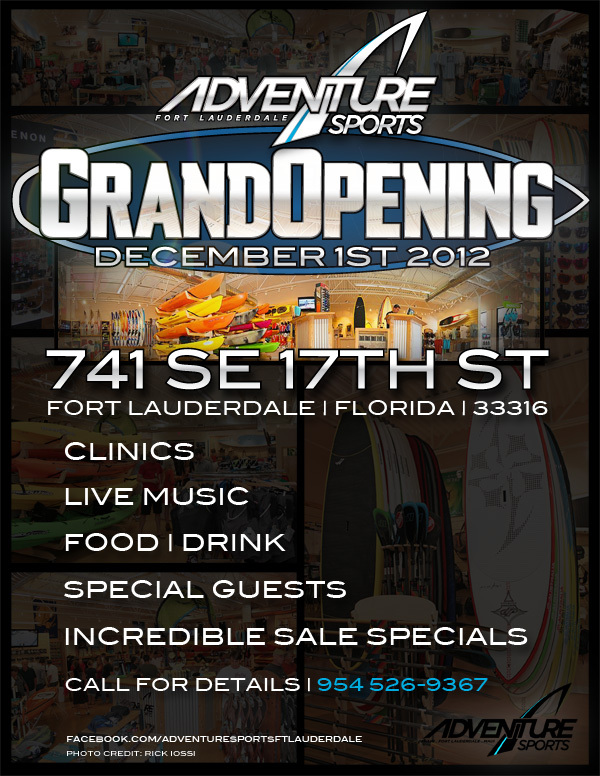 We can take advantage of some great happenings that are going on Saturday. Did you read open bar, rock/blues band, food, prizes & giveaways, above? Yes, it's all going to be there and more and Neil Pryde himself will be there. I'm planning on bringing my blue coffee table book, Will to Win - The Remarkable Story of Neil Pryde Limited, from last year's i-to-i prize giving to the party and have it autographed. 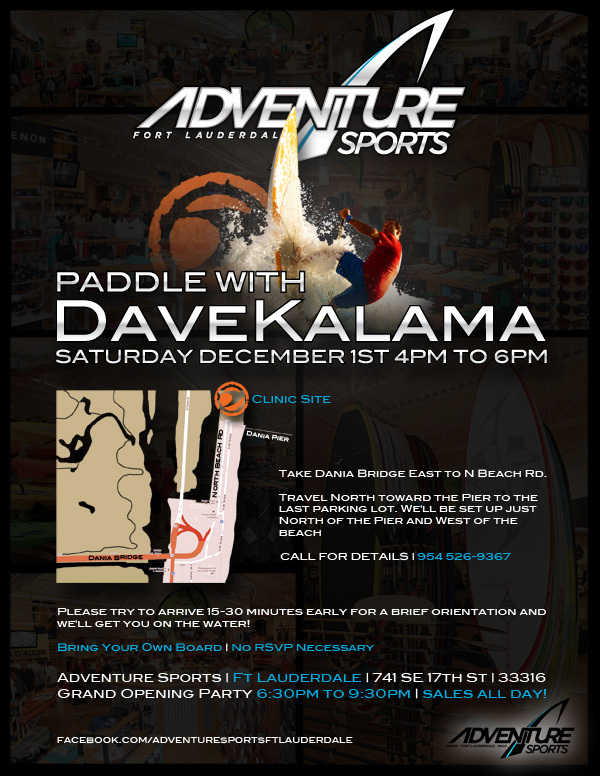 Dave Kalama will be attending as will a number of the Cabrinha team riders. 7). We can hold an after race party at my house on Sunday. Last year many said it was the best party ever. Let me know if you want to attend the i-to-i clinic on Saturday, otherwise I'll see you later on Saturday for the Kalama clinic, the party and of course Sunday morning at the skippers meeting. This could be the best i-to-i ever! Looking forward to seeing you all soon. Pre-race clinic is ON for 1 p.m. today, 12/01/12 at the event site. Conditions were very windy with scary shorebreak, but with the ENE wind direction the people who could point high were able to do the whole course in just three legs. Ron finished in 1:09 with his NP 9.5 and Mike's lab formula board with 64 cm fin. Second place was a hotshot kiter named Zach riding a latest-greatest 70 cm wide course-racing kiteboard. I came in third, way behind the top two, a little under 2 hours. Lots of flying fishes and sea turtles in the monster turquoise swells out at the edge of the Gulf Stream. Pretty amazing! 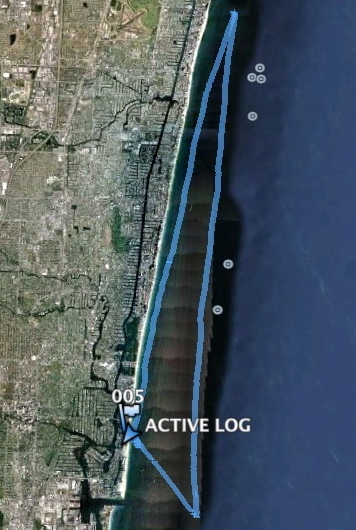 I posted my GPS track. Counting the maneuvers at the start it was 24.5 miles.